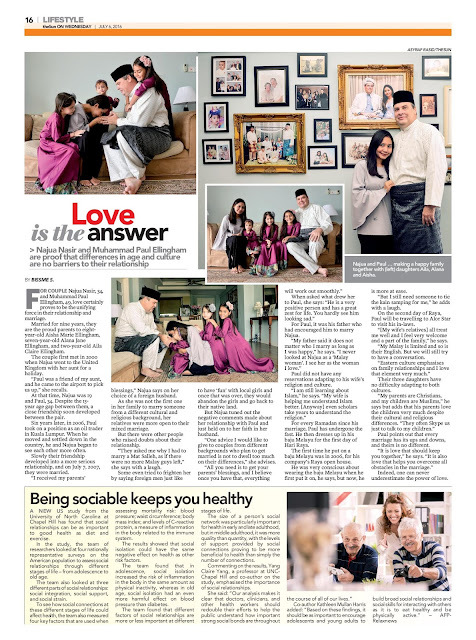 To celebrate Hari Raya, theSun feature a love story that goes beyond race and religion. For couple Najua Nasir, 34, and Muhammad Paul Ellingham, 49, love certainly proves to be the unifying force in their relationship and marriage. Married for nine years, they are the proud parents to eightyear-old Aisha Marie Ellingham, seven-year-old Alana Jane Ellingham, and two-year-old Aila Claire Ellingham. The couple first met in 2000 when Najua went to the United Kingdom with her aunt for a holiday. “Paul was a friend of my aunt, and he came to the airport to pick us up,” she recalls. At that time, Najua was 19 and Paul, 34. Despite the 15-year age gap between them, a close friendship soon developed between the pair. Six years later, in 2006, Paul took on a position as an oil trader in Kuala Lumpur. When he moved and settled down in the country, he and Najua began to see each other more often. Slowly their friendship developed into a more serious relationship, and on July 7, 2007, they were married. “I received my parents’ blessings,” Najua says on her choice of a foreign husband. As she was not the first one in her family to marry someone from a different cultural and religious background, her relatives were more open to their mixed marriage. But there were other people who raised doubts about their relationship. “They asked me why I had to marry a Mat Salleh, as if there were no more Malay guys left,” she says with a laugh. Some even tried to frighten her by saying foreign men just like to have ‘fun’ with local girls and once that was over, they would abandon the girls and go back to their native land. But Najua tuned out the negative comments made about her relationship with Paul and just held on to her faith in her husband. “One advice I would like to give to couples from different backgrounds who plan to get married is not to dwell too much on their differences,” she advises. For Paul, it was his father who had encouraged him to marry Najua. “My father said it does not matter who I marry as long as I was happy,” he says. Paul did not have any reservations adapting to his wife’s religion and culture. “I am still learning about Islam,” he says. For every Ramadan since his marriage, Paul has undergone the fast. He then dresses up in his baju Melayu for the first day of Hari Raya. The first time he put on a baju Melayu was in 2006, for his company’s Raya open house. He was very conscious about wearing the baju Melayu when he first put it on, he says, but now, he is more at ease. “But I still need someone to tie the kain samping for me,” he adds with a laugh. On the second day of Raya, Paul will be travelling to Alor Star to visit his in-laws. “[My wife’s relatives] all treat me well and I feel very welcome and a part of the family,” he says. “My Malay is limited and so is their English. But we will still try to have a conversation. Their three daughters have no difficulty adapting to both cultures. “My parents are Christians, and my children are Muslims,” he says but adds that his parents love the children very much despite their cultural and religious differences. Paul points out that every marriage has its ups and downs, and theirs is no different. “It is love that should keep you together,” he says.